Park your car and walk or shuttle to everything! Trails End condominiums allow you to shop and dine at your convenience! 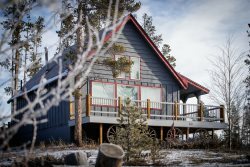 It’s ski-in ski-out location makes it a perfect spot for the outdoor enthusiasts. A free shuttle to all Summit County Ski Resorts is available as well! When your day of skiing, boarding, or shopping is over come back and cook a meal on your gas grill located on your private balcony, warm up next to your gas fireplace, or unwind in the indoor/outdoor heated pools and hot tubs. Walk out the back door of the condo and find yourself at the Quick Silver Express Lift, Quick Silver Ticket Office, multiple rental shops, and Sauce on The Maggie Restaurant. Exit the plaza and you will be a block from Breckenridge Main St and the River Walk Center. The River Walk Center hosts events and concerts all year round!